To be brutally honest, The Dog and I are not early risers. Jackie prefers early mornings and I do try to join in as she greets each bleary morning with gusto, but I just can’t whip up the enthusiasm. The Dog will get up with Jackie, but she comes back to bed as soon as she is given the opportunity. It’s only when it’s past nine in the evening that I really wake up. Dogs, of course are content to doze all day, all they ask is to be fed regularly. 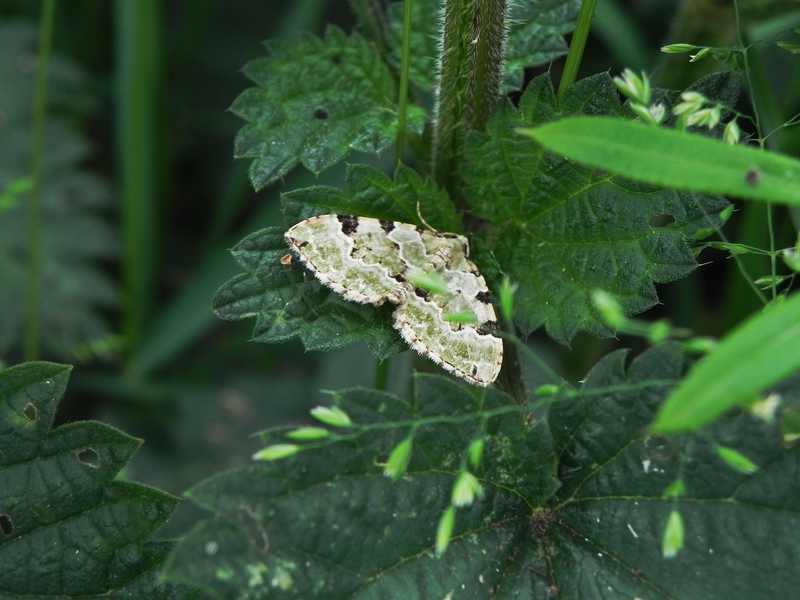 Here we have a Green Carpet Moth. It’s a bit too early for him as well. Until very recently, he’s spent his days, as a caterpillar, happily munching his way through the maze of Hedge Bedstraw, that has taken it upon itself to fill up all the gaps it can find in the Hawthorns alongside the road. I would imagine that he has kept normal business hours during this, caterpillar, stage of his existence. Now, suddenly, he has been transferred to the night shift. He’s a little confused, he’s not sure if he should dose off or eat a leaf. Jackie and I changed out of our caterpillar costumes some considerable time ago. There can be no doubt that Jackie became a butterfly when that particular transformation took over her life. I’m reasonably sure that I changed into a moth. Must watch out for lighted candles. What a beautiful day time moth! Isn’t he! Apparently, I was lucky to catch him looking like this, as the green colour soon fades to a dirty grey!